What is it about the history, geographical position and cultures of the Middle East, North Africa and Central Asia that has made music such a potent and powerful agent? This volume presents the first direct look at the complex relationship between music and power across a range of musical genres and countries. Discourses of power in the region centre on some of the most contested social issues, most notably in relation to nationhood, gender and religion. Individual chapters examine the ways in which music serves as a forum for playing out issues of power, ideology, resistance and subversion. How does music become a space for promoting - or conversely, resisting or subverting - particular ideologies or positions of authority? How does it accrue symbolic power in ways that are very particular, perhaps unique? And how does music become a site of social control or, alternatively, a vehicle for agency and empowerment, at times overt and at others highly subtle? What is it about music that facilitates, and sometimes disrupts, the exercise and flows of power? Who controls such flows, how and for what purposes? In asking such questions in the context of countries such as Afghanistan, Egypt, Iran, Tunisia and Tajikistan, the book draws on a wide range of relevant theoretical and critical ideas, and many disciplines including ethnomusicology, anthropology, sociology, politics, Middle Eastern studies, globalization studies, gender studies and cultural and media studies. The countries and areas explored share a great deal in historical and cultural terms, including a legacy of colonial and neo-colonial encounters and predominantly Judeo-Muslim religious traditions. It is hoped that the volume will contribute ultimately to a richer understanding of the role that music plays in these societies. 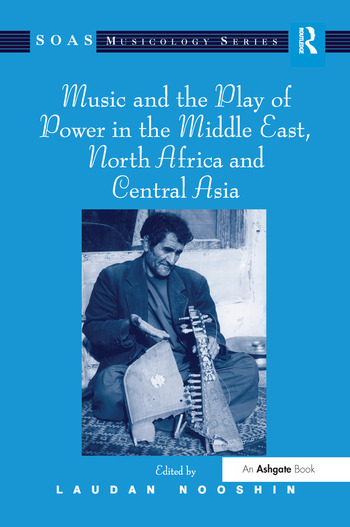 Contents: Prelude: power and the play of music, Laudan Nooshin; 'The artist of the people in the battle': Umm Kulthum's concerts for Egypt in political context, Laura Lohman; Abd al-Halim's microphone, Martin Stokes; Mediated Qu'ranic recitation and the contestation of Islam in contemporary Egypt, Michael Frishkopf; Music, politics and nation building in post-Soviet Tajikistan, Federico Spinetti; Music and censorship in Afghanistan, 1973-2003, John Baily; National traditions and illegal religious activities amongst the Uyghurs, Rachel Harris; Jews, women and the power to be heard: charting the early Tunisian ughniyya to the present day, Ruth F. Davis; Music and politics in North Africa, Tony Langlois; Singing against silence: celebrating women and music at the 4th Jasmine festival, Wendy S. DeBano; 'Tomorrow is ours': re-imagining nation, performing youth in the new Iranian pop music, Laudan Nooshin; The power of silent voices: women in the Syrian Jewish musical tradition, Kay Kaufman Shelemay; Bibliography; Discography; Index.